How time flies! This year the International Coaching Federation (ICF)—the largest and most recognized professional association for coaches—celebrates its 20th anniversary, and I celebrate my 20th year as a professional coach. It’s hard to believe that at the first ICF conference in 1995 the biggest question on everyone’s mind was whether the nascent profession of coaching would survive. Of course, coaching has more than survived. It’s thrived, morphing into more expressions than anyone at that initial gathering could ever have imagined. And it’s still unfolding. For me, coaching is like an extraordinary intricate flower that just keeps blooming, revealing greater depths of complexity and beauty, yet never fading. The more that I open myself to coaching, through my work and my own personal development, the more coaching opens me to see the unbounded potential it contains for transforming the most fundamental elements of our personal lives and shared experiences. The only thing that seems to limit the transformational power of coaching is what people believed it to be. If you think of coaching as a tool to get things done, then that’s what it will be for you. Yet coaching is so much more. Coaching is also a leadership style that focuses on realizing potential in people and in situations. When coaching becomes engrained as an organization’s leadership style of choice, it changes the very DNA of the culture, enabling organizations to collectively respond to any kind of change with increased ingenuity and speed. Coaching is, and does, all of that and more. Ultimately, I’ve come to understand that coaching is a worldview with it’s own set of guiding assumptions and beliefs that profoundly shape how people respond to everybody and everything. When people embrace a coaching worldview they bring their whole selves to whatever they do with the expectation that it’s their responsibility and privilege to evoke positive change by creating shared insights. They value learning with and from each other, and they create opportunities to do just that whenever they can, wherever they are, with whomever they are with. As a worldview, coaching sows and nurtures the seeds of individual and shared peace. Personally, I believe that when coaching is embraced as a way of life globally we will transform who we are and how we are with each other, and usher in a time of deeper appreciation for the value of our differences, and more courageous efforts to manifest peace across every expression of human experience. My highest hope is that someday we won’t be talking about coaching as an event any more because it will just be the way we do things. 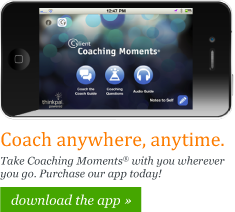 A coaching worldview, in its many expressions, will truly be our shared Worldview. That might sound like a pipe dream, but twenty years ago, no one would have believed that coaching would become what it is today. So why not dream big? Coaches know that’s the first step in truly transformational change. That’s what I hope to see, and play a part in unfolding, over the next 20 years of coaching. I hope you’ll join me. What are your hopes and dreams for the next 20 years of coaching?